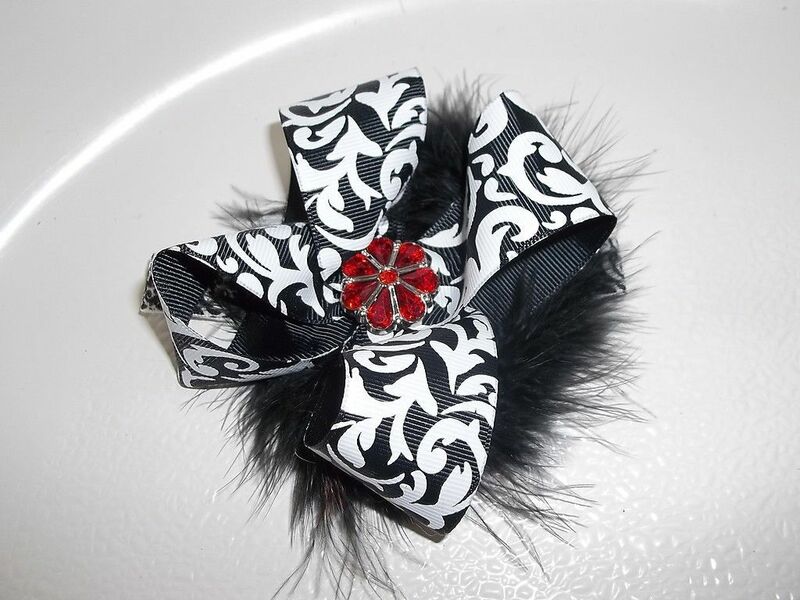 UP FOR AUCTION IS A NICE HANDMADE BLACK AND WHITE DAMASK GROSGRAIN FLOWER BOW HEADBAND. I HAVE ADDED SOME BLACK MARABOU. THE BLING ON THE HEADBAND MAY VARY DEPENDING ON AVAILABILITY. THIS PARTICULAR HEADBAND IS A NEWBORN SIZE BUT I CAN MAKE IT TO FIT YOUR CHILD. ALL OF MY ITEMS ARE MADE/STORED IN MY CLEAN, SMOKE-FREE HOME. ***** PAYMENT ****** PLEASE PAY FOR YOUR WINNING AUCTION ITEM WITHIN THREE (3) DAYS OF AUCTION END. IF YOU CANNOT PAY WITHIN THE 3 DAY WINDOW, PLEASE EMAIL ME. ON THE 4TH DAY OF NONPAYMENT, EBAY AUTOMATICALLY STARTS IN MOTION A NONPAYMENT CASE. ***** SHIPPING ***** I NOW OFFER FREE DOMESTIC SHIPPING. I STILL COMBINE SHIPPING FOR MY INTERNATIONAL BUYERS, WHEN I CAN. THANK YOU FOR VISITING MIMI'S PRECIOUS DESIGNS. LOOK FOR ME ON FACEBOOK AND BONANZA.COM. Powered by eBay Turbo Lister The free listing tool. List your items fast and easy and manage your active items.